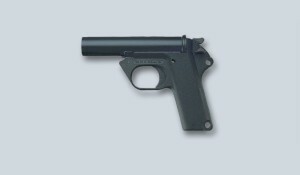 One of the most basic methods of igniting a flare is through the use of a hand held ‘Very’ pistol or signal flare gun. Lighting a flare using such methods, although common place following the decommissioning of a dysfunctional ignition system, relies upon operator competence, weather conditions and a combustible mix being present at the flare tip. When used in conjunction with continuous pilot burners, this method of ignition maybe considered acceptable as the use is likely to be limited to start up operations. It should be noted that the operator is likely to require fire arms training and a gun licence. Suppliers of these types of gun and the associated cartridges are easily found on the Internet (Argo do not offer them). Check the range and specification before purchasing. Heckler and Koch are well known manufacturer.